Emmanuelle Copeland is a senior at DGS. Over the past four years, she has been committed to both the arts and sciences. Copeland is the vice-president of her school’s masque and gavel. Copeland is also the head of the hair/makeup/costume crew for productions done at DGS. Although she is dedicated to the performing arts, she is also a competitive artist in the visual arts. Copeland has been accredited to various competitions. In the last year, Copeland has won best-in-show at the General Exhibition of the Illinois High School Art Exhibition. Most notably Copeland is a national gold medalist with an American Vision Award. 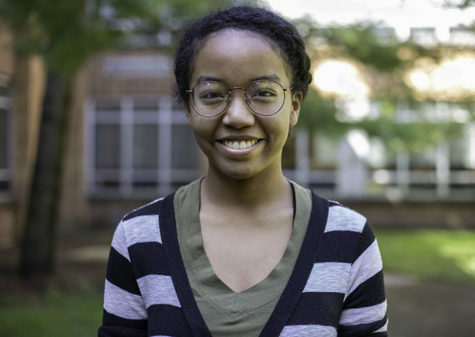 Copeland is also the secretary of her school’s research club, currently working on a research project with Lewis University to develop a photocatalytic nanocomposite water filter. She is also on the Citizens’ Climate Lobby and remains a politically active community member. She was also a member of the 2018 State Champion journalism team.